In this page we will learn struts 2 annotation based exception handling. @ExceptionMappings and @ExceptionMapping are two annotations to handle exception in struts 2. Find the syntax below. The above annotation can be used at class level and it will be applied for all action defined in action class. exception attribute: This is the attribute which declares the exception class. result attribute: This plays the role to get result so that appropriate page could be redirected. params attribute: The value defined by param is passed to result. If we want to handle exception action wise, we can use annotation at method level as below. In our example I am using @ExceptionMapping at class level. To develop and run the demo, we need below softwares. Find the action class that is annotated with @ExceptionMappings at class level. There is one method in action class that is throwing NullPointerException. 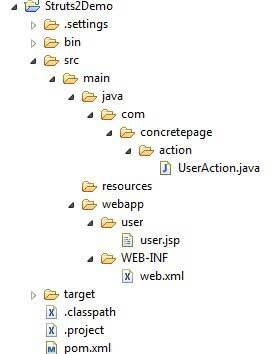 result attribute of @ExceptionMappings transfers the control to jsp related to SUCCESS result. Find the jsp which displays the result. There are two attribute with which error is displayed on view page. exception : displays short description of error. exceptionStack : displays the stack trace of error. Find the maven dependencies to run the struts application. Find the screen shot of eclipse configuration. To run the application use the URL http://localhost:8080/Struts2Demo-1/user/demo and output will look like as below.